Broccoli cheddar soup is, in my book, an ultimate comfort food. The epitome of simplicity, it speaks of autumn afternoons and bookshop outings with my grandmother. After school, we'd walk around our neighborhood in Chicago, select new books at Barnes & Noble, and then stop to have broccoli cheddar soup at the Corner Bakery.Thanks to these outings, broccoli cheddar soup became a food we never tried to recreate at home, and it consequently became a food associated with our days in Chicago. Lately, my grandmother's picked up an interest in food blogging on Instagram, and so she sends me recipe links several times a day with different foods she wants to make. Several of the recipes she's sent me in the last few weeks have been for broccoli cheddar soup. 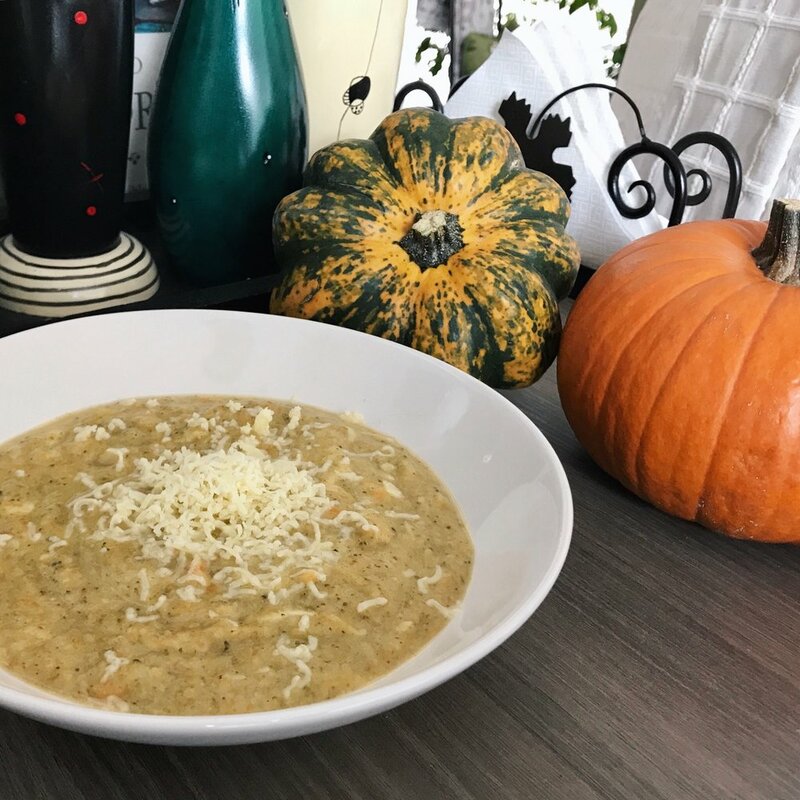 The only problem was that all of the recipes were different, and, instead of settling on one, we decided to mix things up and make the soup both more Swiss and more seasonal by adding pumpkin, spice, and a bit of Emmental. Begin by heating the olive oil in a large pot. Add the onion, carrot, and pumpkin and cook until the pumpkin softens, 10 to 20 minutes. Whisk in the flour and cook until golden. Gradually add the milk and then the vegetable broth, continuing to whisk. Add the spices. Add the broccoli florets and bring to a simmer and cook until the pumpkin and broccoli are tender. Remove the soup from the stove and then purée with an immersion blender, if desired. *** Personally, I like the soup just as much without puréeing it, though some may take issue with the pumpkin chunks. Return the soup to the stove and add the cheese. Stir and allow for the cheese to melt and the soup to become creamy. Serve on a brisk autumn day and enjoy as comfort flows through your veins! * Most of the recipes we looked at called for whole milk, but we made ours with 1% and were happy with the outcome. 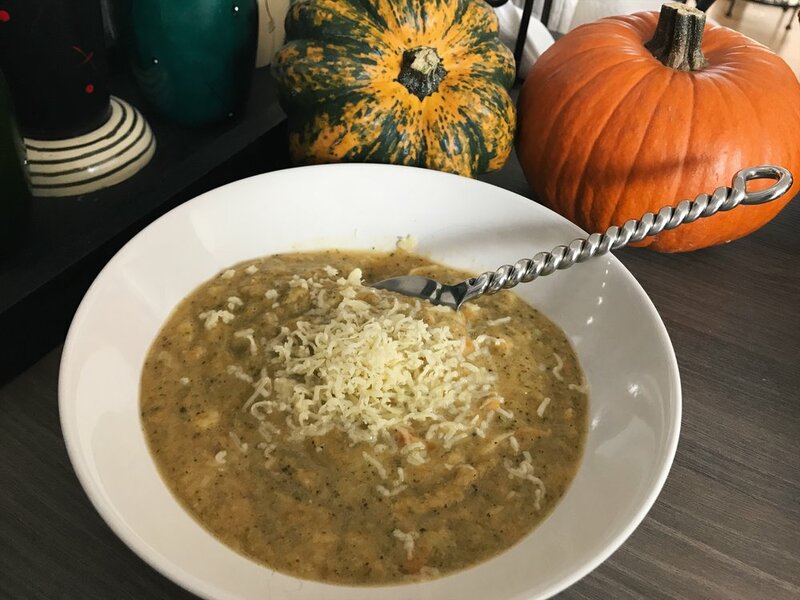 In fact, I'd say that if you want to make this vegan and leave out the milk and the cheese and increase the pumpkin, this would still make for a very good broccoli and pumpkin soup. ** This is a lot of cheese, so feel free to use however much you feel comfortable with! *** My grandmother insists, very strongly, that the soup needs to cool to room temperature to do this.